In this series of blog notes we have discussed what is needed to quantify color and how light sources are quantified. The second element of the visual observing model that must be quantified is the object that modifies the white light source. There are four categories of objects: opaque non-metal, opaque metal, transparent, and translucent. Opaque non-metals do not allow any light to pass through and can include objects such as the cover of a book or a wooden table top. Opaque metals are bare metallic objects that do not allow any light to pass through and can include a chrome faucet, aluminum pan, or gold candle stick. Transparent materials allow much of the light to pass through and can either be solid or liquid. Some examples of transparent samples are a glass window or water. Translucent materials allow some light to pass through and can be solid or liquid. Some examples of translucent materials are a single sheet of paper or orange juice. All objects modify light. Colorants such as pigments or dyes selectively absorb some wavelengths of light while reflecting or transmitting others. 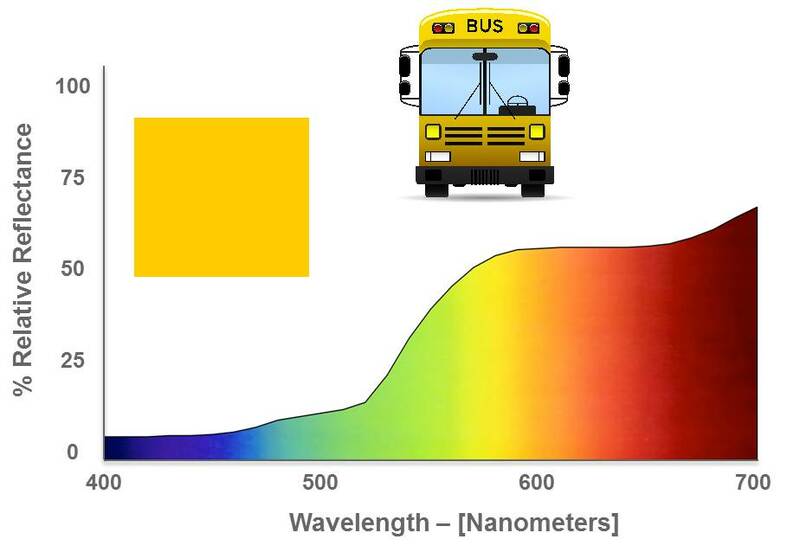 The amount of light reflected or transmitted by the object at each wavelength can be quantified. This is represented by a spectral curve, as seen in the picture above. The second element of the visual observing situation is quantified by measuring the relative reflectance or transmission of an object. HunterLab instruments are able to measure the amount of light reflected or transmitted by your samples. This effectively quantifies the second element of the visual observing situation model.